The Little Bald Hills Trail is the longest path beginning in Jedediah Smith Redwoods State Park, though only about 1.3 miles is within the park boundary - the remainder crosses a detached section of Redwood National Park, and then enters Smith River NRA, ending at an alternative, less used trailhead near South Fork Road. 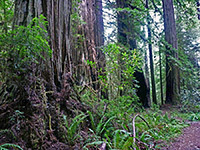 Unlike all the other trails in the state park, old growth redwoods feature just near the start; the route begins in the dense, dark forest near the Smith River and climbs steadily, through different types of woodland including, at various stages, young redwoods, Jeffrey pine, knobcone pine, Douglas fir, tan oak and Port Orford cedar. Three miles from the start, after gaining 1,500 feet and leveling out along a high, gently undulating ridge, the trail reaches the first of many clearings which allow long-distance views over the coastal mountains - these low, partly wooded summits are the Bald Hills, and they extend for another 3 miles before the path starts to descend. This is the only trail in the park also open to horses and cycles, which account for most traffic along the upper sections; for hikers, the usual target is the start of the open sections, about 3.5 miles. A primitive campground at the 3 mile point (within Redwood National Park) facilitates multi-day trips. Despite the varied vegetation, not many people hike the path, since the trailhead is somewhat hidden, the large redwoods extend only a short distance at the beginning, much of the first few miles are rather steep, and there are no good views until relatively far, after three miles. The path does at least have the added attraction of solitude (apart from occasional downhill cyclists), unlike some other paths in the vicinity such as Stout Grove and Boy Scout Tree. 16 views along the Little Bald Hills Trail. 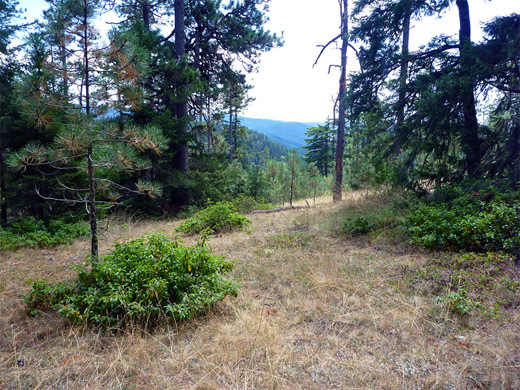 The Little Bald Hills trailhead is along Howland Hill Road, a third of a mile west of the point where the pavement ends, at the edge of the little community of Douglas Park, beside the Smith River. A parking area right next to the road is for the Hiouchi Trail, which links with Stout Grove half a mile west, while a 200 foot side track climbs slightly to a big, circular parking area, for the Little Bald Hills. This place is out of sight of the main road and would perhaps be a good primitive camping location, as there are very few other suitable places hereabouts. All vegetation along Howland Hill Road has a thick covering of white dust caused by the heavy vehicle traffic, but the bushes and trees along the spur track at least are natural in appearance. The trailhead notice includes a map and several photos of the trail, which is mostly wide and smooth, originally a logging track. 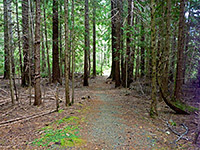 The path enters dense redwood forest, climbing very gently; a broad, straight, reddish-earth corridor through overgrown woods, which have a good mix of differently sized trees, bushes (including hemlock, alder, huckleberry and rhododendron) and ferns. Benches have been installed beside several named memorial groves. A small stream (Cedar Creek) flows out-of-sight a short distance west, helping to sustain a fair selection of really big trees. After half a mile or so, the land rises more steeply, and the trail gains height via a series of S-bends, up a sloping ridgeline, after a while moving to the east side of the ridge, round a corner and abruptly into a different forest, where the large, relatively well spaced redwoods are replaced by much smaller trees, growing closer together, though still with many ferns, and a scattering of ancient mossy stumps, evidence of logging operations in the early 20th century. A long, straight, less steep section, along which a few gaps in the forest allow very brief glimpses of the steep sided South Fork valley to the east, is followed by a more overgrown patch, either side of a tiny stream. Some more bends and steep parts take the trail up another few hundred feet to a generally more open, flatter area where the trees - now mostly Douglas fir and Jeffrey pine - are mixed with smaller, big-leaved shrubs, and later with oak. Further climbing reaches a drier environment, the trees still predominantly pine, and the first few patches of grassland start to appear. A notice warns against walking along an older, slightly shorter alignment of the trail, which has been rerouted to avoid a diseased patch of cedar trees. A junction after 3 miles is with a short path to the four-site NPS campground, set in a clearing at the edge of a large meadow. Facilities here include tables, a corral, firewood and water tap, though the place is not too appealing, often strewn with litter. The main path continues for several miles across the mostly flat land at the top of the Bald Hills, alternating between grassy patches and airy woodland. 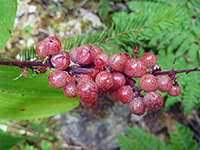 The surroundings have a limited selection of flowers, found mostly at the side of the trail and in the meadows.